Suze Orman Releases Prepaid Card. Wait, What? Suze Orman, one of the most well known personal finance gurus in the media, announced a few days ago that she had created, and was releasing, a new prepaid debit card. Prepaid debit cards, if you’re not familiar with them, are cards, like credit cards, where you prepay and then can only use the card for amounts up to what you’ve prepaid. In most cases, they are marketed towards people who are unable to get credit cards because of bad credit. Terrible way to take criticism, Suze. To some degree, I discount her response because of the “sassy” way that she responds to questions and such on her shows, but I think she crossed the line here. It’s one thing to tell the guy who calls in and asks if he should buy a new car when he’s 500k in debt an idiot, but another thing altogether when you’re calling a guy an idiot simply because he thinks your new prepaid card is a bad product. Is the card a bad product? To Suze’s credit, unlike some prepaid cards that have had celebrity endorsers, this one has plenty of good things going for it. It includes a credit watch program, and a free credit report with credit score. It’s got a program to allow you to put money into a separate account for an emergency fund, free bill pay, and the ability to transfer money from one cardholder to another. But, my Credit Union has all those things. A $3/month fee on the card isn’t the worst of the cards, but it’s still a fee. $36 a year to have access to your own money via a debit card? Come on. Again, my Credit Union does that, and they do it for free. Yes, there are some who are unable to get a bank account. And for those people, if you absolutely need to have access to a Visa/Mastercard card, then go for it. But, despite what Suze is claiming, don’t expect it to improve your credit score. There is no way that any of the credit agencies are going to take your activity on a prepaid card into account. They’ve never taken your cash spending habits into account, and a prepaid card is no different than spending cash. Would it be nice? Absolutely. Many of us who make most of our transactions on debit cards or with cash would agree. But, it isn’t going to happen. Your cash spending has nothing to do with your credit, so why would a credit score take that into account? I just don’t see enough difference between this, and other similar cards to say that Suze went out on a limb here and created a product that is going to change the industry. As a prepaid card, it’s decent. There are better. In the end, it’s still just a prepaid card that should be used as a last option when you can’t/won’t get a bank or credit union account with a debit card. And that’s just a smattering of the posts on the subject. I have yet to come across one that is entirely positive about the card. What do you think? Do you think that Suze did a good thing here, or is it just another way to milk some money out of her followers? This doesn’t surprise me! Another person taking advantage of people who cannot manage their money. I only wish Suze had thought more about the people this product could actually help. Some people cannot qualify for a checking account, and Suze’s card (or a similar card) is the perfect option for them to realize the ease of owning a debit card. Unfortunately, these cards don’t build credit. So if Suze had thought a little deeper about her product, she could have worked out a partnership with some company that would allow these customers to use the card and build credit. Wow, I can’t believe she responded like that in a Tweet, not only calling one person an idiot, but then talking down to another who she has no reason to think isn’t a fan of hers looking for answers. It’s just not a very helpful sounding Tweet by any means. I wonder if she actually controls that account and is the person actually Tweeting the messages. Maybe one of her employees just got overzealous or something. I’m not a fan of the card either. I’m pro-profit, but I’d rather my finance guru weren’t doing it at the expense of their customers. I think the bad outweighs the good. Why offer scoring from only one agency? Why charge customers $2.50 to talk to an agent? Plus all the other fees that are so long that I couldnt screen grab it on a 27 inch screen. This product is going to put a lot of ppl in the hole. I don’t mind pre-paid cards, I used them to shop online. But my bank issues them at no charge. 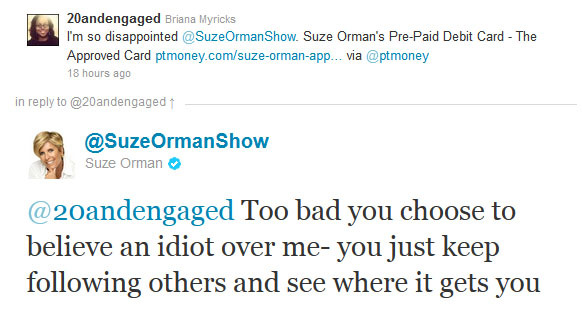 Suzee Orman should be knee-deep in retractions by now. Suze Orman’s card is not a bad prepaid card, but it is nothing more than that either. It is not even the best prepaid card out there, as that distinction belongs to American Express’ prepaid card, which comes with no monthly fees at all. @Christa: To be fair to Orman, she did get TransUnion to monitor the usage of people with these debit cards (albeit, thus far they haven’t committed to actually allowing the use of these cards to influence your credit score (which makes sense, since how you handle a prepaid card and how you handle credit are two different things); so far, it sounds like little more than, ‘perhaps in the future this card might, MIGHT, have some (small) impact on how much credit agencies trust you’.) Not a bad idea, but pretty poor execution, especially given how many other fees are attached. As for some of her responses on Twitter…wow. I know she has a reputation as being a tough one, but wow. There’s a line between using strong language to defend your position and simply being insulting to your detractors; Orman seems to have driven right over that line while laughing in the rear-view mirror. Granted, she did spend much of the latter part of last week apologizing for her comments, but still, not the best way to handle things, in the slightest.